List View. Lets you see more detailed information about each of your videos. Filename, folder, file size. Expanded Search. All your videos will be found - no matter which folder you place them to. Folder Support. Sort your videos by folders they are located in. 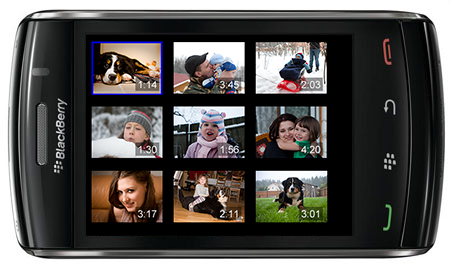 Up to 1,000 videos can now be added to the gallery, for the heavy duty users. Improved UI in the Grid View. See more of your videos on the screen. Filenames are visible (for non-touch devices). Launch Video Camera right from Good Video Browser. Watching your videos may inspire you to make a new one - it's quick and easy now! Support for MP4, 3GP, 3G2 and MOV files. The application is also now available in BlackBerry App World. To celebrate, they have offered up 200 coupons to the CrackBerry community to thank them for their support. Just use the coupon enjoyvideo in the mobile CB store to get 50% off. This is not a contest - just use the code to get 50% off the application.